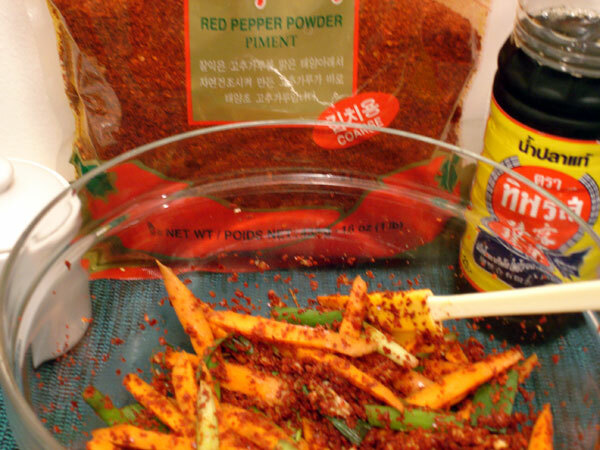 2 main seasonings: Fish Sauce and Red pepper powder. Garlic, ginger, scallions and carrots are ingredients I always have in the house. 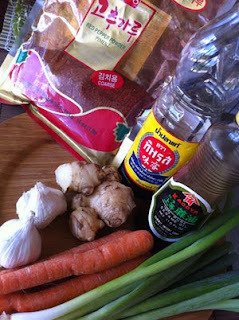 I’m all for saving time because that’s what we all lack, so I’m going to show you my Easy Kimchi without brining! 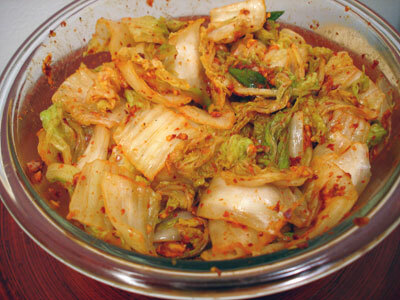 Kimchi is the Korean way of pickling (fermenting) vegetables. After a few experiments, I discovered by skipping the brining step, the results were even better! You’d think brining would make the veggies more crunchy because you’re eliminating the water but I found it didn’t make a difference and in fact I prefer it. I also omit the rice flour and sugar. 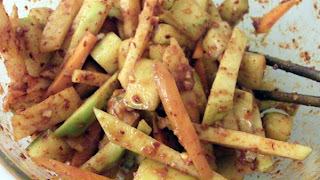 My personal preference is crispy, crunchy Kimchi before it ferments too much making it sour and soft. I start eating it the next day and go as fast as I can. I’m sure my Korean foodie friends would be horrified with this. It’s just what I like to do – turn recipes to suit my own taste and I encourage you to do the same, it’s so much fun. 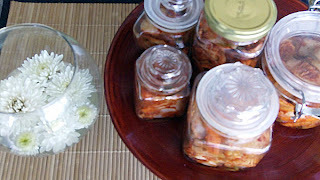 However, I’ve provided a few links to other Kimchi recipes so you can choose how you want to make your kimchi or kimchee. Many recipes require you to make a ton, one starts with 10 pounds of cabbage!!!! To me, that makes cooking a chore and stresses me out thinking about the quantity. It takes TIME (always goes back to this), then finding/buying/cleaning jars to store it. No, no, we are not making this to resell, just as a little side dish to go with our dinner! 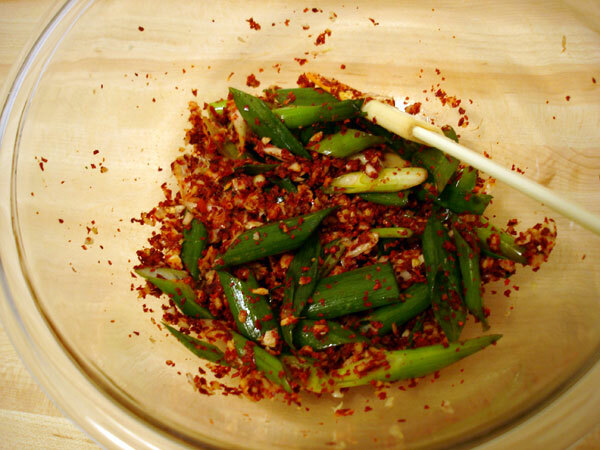 Try my Easy Kimchi and feel free to make your own variations, that’s what being a Wok Star is all about. Do share an unusual kimchi you’ve made. Hey, I didn’t even use a wok in this one! Update: eliminated using a bowl to mix, just use a big tupperware container. Mix & store all-in-one! 6. Peel into it right away the next night and see if you’re not astounded how good it is! Mix all seasonings in bowl. I didn’t realize you could ‘kimchi’ anything. I always associate it with napa cabbage cause that’s what we had with Bulgogi (Korean BBQ) growing up in Hong Kong. Use chopsticks or wear disposable thin gloves for mixing. You don’t want to use your hands cause the red pepper powder is pretty spicy and discolors your hands. Don’t ever put your hands anywhere near your eyes after touching chilies! My 1st Kimchi had more napa cabbage. Give it a taste, you want it to be a little bit salty, so add a little more fish sauce but be careful, cause a little goes a loooong way. This experiment was with chayote, jicama, carrots, radishes and 1 tblsp toasted sesame oil. Tip: If you have leftover seasoning, store in a container or zip loc and freeze it for another batch. I first learned how to make kimchi here. Another interesting angle, jumpstart with old Kimchi juice! There’s even a chef who calls himself a lactofermentation and pickling instructor who started a Kimchi Festival in Boston! This blogger has really impressed me with his food adventures, considering he started late in life. We cannot mention kimchi without mentioning this youtube celebrity, here’s her video and her kimchi! Here’s my Korean twitter buddie’s authentic version, scroll down for kimchi. If you live in Miami, Little River Garden gives Kimchee workshops! Found out from Mango and Lime after she went to one.